First, governments in the region—even those with seemingly strong and well-funded militaries—have high corruption vulnerabilities and may be more fragile than they appear. There is evidence that because of corruption, nepotism, and a lack of transparency, rising defence budgets in the region are not being spent on arms and equipment that actually meet countries’ strategic security needs. Second, corruption is a very powerful enabler of conflict. It feeds the proliferation of arms, facilitated by poor export controls systems and the infiltration of organised crime into the security sector. Third, public trust and the state legitimacy it brings—perhaps the most important element of long-term security in any country—is greatly diminished by corruption. Corruption has fuelled political unrest, extremism, and formed a narrative for violent extremist groups. Our research should also spell caution for states exporting advanced defence capability to the region. With few institutional checks and balances, the risk of arms increasingly proliferating across the region is extremely high. The combination of rising arms imports, weak oversight and controls on strategy and spending, and low public engagement is dangerous and exacerbates the risks of future conflict. Governments in the region and their international allies should prioritise the creation of accountable defence institutions that operate with integrity on behalf of their populations, in order to achieve sustainable security. 3. Defence spending rising – but is security increasing? The countries studied in this report spent more than $135bn US on military expenditure in 2014, comprising 7.6% of global military spending. Their military expenditure as a percentage of GDP is the highest in the world, with the region spending an average of 5.1% of GDP on defence in 2014.1 In most cases this represents a significant portion of public spending. According to the Saudi Arabian Monetary Agency, for example, defence and national security spending comprises 30% of government budgetary allocations. There are particular increases in the Gulf region. Saudi Arabia and the UAE were among the five largest importers of major weapons since 2010. States in the Gulf Cooperation Council (GCC) have increased their arms imports by 71% in the last decade, while Saudi Arabia has made the world’s largest spending increase of 17% between 2010 and 2015. (SIPRI, 2015). Yet it is not simply the scale or pace of defence spending that sets the MENA region apart. The region currently accounts for approximately over a quarter of the world’s opaque defence spending.2 The $120 billion spent on defence & security last year was matched by the near-universal absence of independent scrutiny, with no legislature receiving detailed or timely information on the defence budget. Secrecy across security and defence establishments remains the norm. Budgets are not published. With the exception of Jordan and Tunisia, none of the countries studied in the 2015 GI publish their defence budget, or provide only highly aggregated or vague figures. Oversight is weak. There is no evidence in any countries in the region that parliamentary defence committees can exert meaningful influence on defence decision making. No committee is provided with detailed information on the defence budget. No meaningful information is provided on secret spending in any country in the region. No country studied makes public what percentage of defence and security expenditure is dedicated to secret items. Poor controls over personnel, which undermines operational effectiveness. Effective defence institutions align spending with real security needs, driven by the interests of the population. There was no evidence from our GI assessments that the expansion in military power in the region has been carried out in support of national defence strategies. Only two countries, Lebanon and Tunisia, have any debate on their defence policy, and even in those states, there is no formal consultation process involving the public and the legislature has limited or no influence over policy. Acquisition planning—the process through which the state identifies what arms it will buy—is unclear or non-existent in every state studied. As a result, individual decisions consistently appear to override technical needs. Non-strategic procurement has a significant impact on militaries’ ability to fight effectively: they may procure equipment that is unsuitable or that they cannot properly man, or acquire multiple platforms that serve the same purpose. The lack of any meaningful legislative debate or oversight of the defence acquisition process enables those in positions of authority to manipulate these systems for personal benefit. Strong oversight and reporting mechanisms are central to maintaining the rule of law. Effective parliamentary and public oversight, internal corruption policing agencies, and whistle-blower protection all ensure corrupt individuals are held to account and strengthen institutions. The excessive secrecy involved in both the management of defence budgets in the region as well as the lack of transparency over capability and intent has obvious implications for fuelling regional arms races. But opacity and institutional weaknesses in the sector are also facilitating the movement of arms across borders, increasing the potential for further regional insecurity and generating ever more reasons to increase defence spending. Evidence of arms from a wide range of countries reaching the hands of non-state actors such as the Houthi rebels and ISIS are well documented. According to a United Nations Security Council report, ISIS and the al Nusra Front currently have numerous military assets seized from conventional armies; the authors note that “the scale of these seizures can be grasped by noting that ISIL [ISIS], in June 2014, captured vehicles, weapons and ammunition sufficient to arm and equip more than three Iraqi conventional army divisions.” The report also notes that “several member states have reported that arms dispatched into the Syrian Arab Republic by actors in the region and beyond have ended up in the hands of ISIL and ANF”. Yet evidence also shows that many improper sales and transfers happen well away from evidently fragile environments, under a thin veil of legitimacy. This creates numerous opportunities for corruption. Given the backdrop of conflict, high risk of diversion and in some cases critical corruption vulnerability of defence institutions, there is a strong national security case for exporting states to focus on governance. The export of military capability to a country where there is not a strong foundation for state legitimacy is an export into an inherently unstable environment. There is, however, little evidence of any significant shift in approach by major supplier states since the Arab Spring. Fortunately there are already relevant provisions in, for example, the EU’s common position on arms export control which could be easily strengthened. Stronger global practices such increased conditionality on both arms sales and service delivery for existing weaponry as well as improved end-user licensing procedures could be used to encourage greater accountability and transparency. Supplier states could also increase the transparency of their exports as a means of empowering the citizens and parliamentarians of recipient states. They could also encourage their own military and law enforcement agencies to integrate anti-corruption or integrity building efforts into international cooperation. Only three countries in the region, Lebanon, Kuwait and Tunisia, have any formal provisions and bodies for independent legislative scrutiny of defence. For parliaments to succeed, they must be able to convene independent and representative defence committees that are guaranteed access to the information they require. Precursory provisions for legislative representatives exist in all states, and most notably in Jordan and the UAE, that could be built into useful mechanisms. Representative legislation can provide executives with the confidence that they will be supported by the public, in turn strengthening their country’s sovereignty. In Iraq, a member of the Defence and Security Commission of Parliament has raised questions about corruption in a military aircraft purchase. Legislative committees must be provided with enforceable powers to investigate all matters brought to their attention, to call witnesses before them, and to raise legal cases against individuals and entities wherever appropriate. In Saudi Arabia, the creation of Nazaha, the Commission of Integrity, offers opportunities to institutionalise oversight providing its mandate is expanded to explicitly cover defence, and be allowed in law and practice to operate free from political independence—and be held to high standards of transparency itself. Similarly the Inspector General system in Iraq, and the Supreme National Agency for Combatting Corruption (SNACC) and the General Inspectorate in Yemen are examples of institutions created to tackle corruption. Whilst these organizations undoubtedly have problems in their current effectiveness and mandates, they could be vital tools to tackle defence corruption if expanded and strengthened. In Tunisia, defence budget transparency is improving. To make scrutiny more effective, greater information should be provided in an accessible way to the public. The Tunisian Ministry of Defence publishes some activities on its website and holds media briefings and some civil society engagement. Prior to the Houthi rebellion, the Yemeni Ministry of Defence held its first ever press conference. 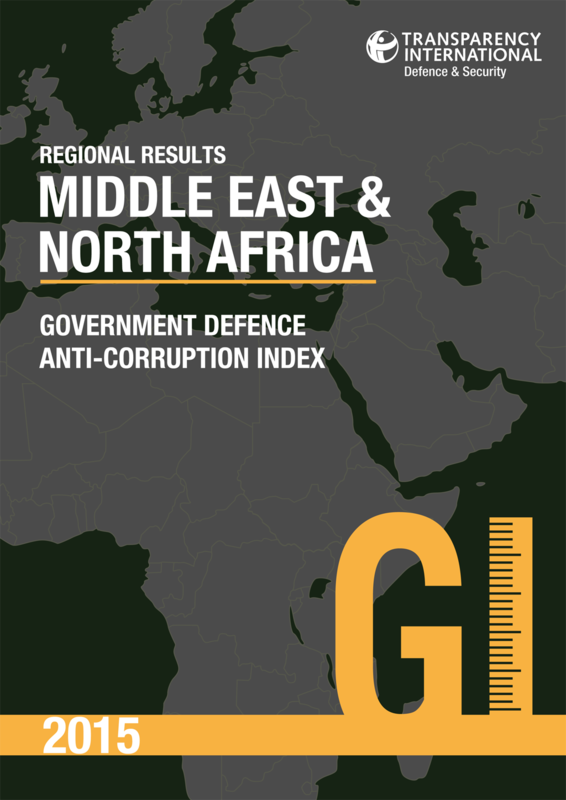 Governments in Iraq, Jordan and Saudi Arabia completed a government review of the 2015 GI research, which shows a remarkable willingness to open a dialogue with an international NGO on corruption issues. There is evidence the media has been able to engage in some defence-related debate in Libya and Tunisia. This should be fostered—such public engagement in defence governance is a building block to effective, accountable defence institutions that serve and protect their publics. Asia is home to some of the most dynamic emerging powers in the world, and with economic growth has come massive expansion in military expenditure. Chinese military spending has increased by 441% in the last decade, India by 147%, South Korea by 106%, Pakistan by 107%, Bangladesh by 202%, and Sri Lanka by 197%. Within ASEAN, there have been huge increases as well: Indonesia by 189%, Thailand by 207%, Cambodia by 311%, and the Philippines by 165%. But it is not just the size of Asian defence budgets that matters. The big question is how will all this new power be governed, and in whose interest? Our research nds that exponential growth in military might is often characterised by high levels of secrecy, and low levels of accountability, oversight, and transparency. The intention underlying the rapid growth of military capabilities of countries is not always clear to their own people, never mind their neighbours and the outside world. First, in some rising Asian powers there is a gulf between growing military spending and adequate checks and balances on military elites, posing a threat to stability in the region. Second, while China’s military might is re ected in defence strategies and acquisition plans of many of its neighbours, there is still cause for optimism. There are good examples of high levels of accountability, transparency, and integrity across the region, which serve as important constraining forces on defence power. Third, in some cases armed forces are acting in direct contradiction to the needs of their people, and in many countries public con dence in the state is undermined by the diversion of public money through poor procurement practices. In 65% of the countries we studied, public trust in the military’s ability and will to address corruption was very low. Our research demonstrates the urgent need to strengthen the integrity of defence forces in Asia. In a highly populated region, with overlapping territorial claims and rising defence budgets, stability depends on establishing clear standards for the way military power is governed, based on accountability to citizens and transparency. But while many leaders across the region recognise the threat corruption poses to their legitimacy and the security of their nations, we found insuf cient effort is directed to building strong independent institutions, or to establishing regional standards. Leaders who seize the opportunity to tackle these issues will not only strengthen their military effectiveness and protect their borders from external threats, but leave a legacy of prosperity and stability for future generations. Growing economies have enabled rapid expansion in military capability, in many cases fuelled by security tensions. The 17 countries studied in this report spent approximately $432.7 billion on military expenditure in 2014, comprising 24.5 % of global military spending. And much of this spending remains highly secretive. Oversight of defence budgets, essential to holding the sector to account, is often minimal. And the argument that openness can undermine national security is frequently exploited to avoid accountability to citizens. This is even more pronounced when it comes to “secret” budgets, expenditure relating to intelligence services and national security, where mechanisms for scrutiny are almost entirely non-existent. The international community has been pressing China for greater defence transparency for a decade or more; in 2015 the Chinese Government published their rst defence strategy. Putting aside whether China’s shift towards “open seas protection”, “territorial air offence”, and a “cyber force” provides strategic reassurance, it is only barely a step forward. After almost consistent double digit increases in defence spending since 1995, China now represents around 12% of the world’s defence spending and 30% of the world’s secretive defence spending. Our research points to major gaps in transparency and institutionalised structures for oversight. Greater transparency is only one part of building regional con dence in China’s military expansion. More information on defence capability will do little to assuage neighbours if it is not matched by transparent checks and balances on power. Secretive decision-making in defence creates perceptions of unpredictability, causing observers to draw a host of very different conclusions over underlying motives. When there is low trust, transparency over new capabilities can be interpreted as an attempt to intimidate. So it is vital for regional stability that there are substantive mechanisms through which Chinese decision-making on defence and security policy could be meaningfully debated and challenged. We found little or no evidence of this in our research. In a highly populated region with overlapping territorial claims and rising defence budgets, the stability of Asia depends on building a common understanding of how military power should be governed. The security of the region would be greatly enhanced by recognition that there is an acceptable way of managing military might, based on accountability to citizens and basic transparency through which effective independent oversight of policy, budgets, and military behaviour can be exercised. Across much of Asia there is good evidence of exactly this sort of responsible approach. Nearly half of the of countries had some formal provision for legislative scrutiny of defence policy; in over half, defence policy was at least partly debated with the public and the published defence budget contained some detail broken down by function. ASEAN has the potential to play a pivotal role in new Asian norms on military governance. The ASEAN Political Security Blueprint has already set a clear aspiration for ASEAN to be a rules-based community of shared values and contains a statement of intent on anti-corruption. Our research shows evidence of a firm foundation for realising this vision. Despite ASEAN’s stated ambitions, there are weaknesses across all member countries and too many cases (including the promotion of good governance and efforts towards a rule-based community of shared values and norms) where the blueprint for accountability and governance laid out by the community is not being implemented. No countries publicly disclose the level of expenditure allocated to activities relating to intelligence services and national security, except for the Philippines. There is effectively no legislative scrutiny of secret budgets nor are they audited for parliamentary debate – with Indonesia being the one exception, though there remain signi cant exclusions made to the information submitted. And barring Singapore, off-budget military expenditure is permitted in every other country. There are also several examples of a direct contradiction to ASEAN values outlined in the blueprint and beyond. ASEAN has yet to make an impact on hard security, either resolving internal disputes or working together to check Chinese assertiveness in the region. But it has fared much better where non-traditional security challenges are concerned, including transnational crime. An agenda of building integrity in defence could be an important means of practically implementing ASEAN’s shared set of values, creating internal cohesion, and deepening defence collaboration in the process. As the second largest military spender in the region, India distinguishes itself through independent institutions with clear mandates for overseeing defence agencies. The Controller and Auditor General (CAG) of India, an autonomous and robust institution, along with the Public Accounts Committee (PAC), a well-resourced and active legislative body, have exercised active oversight. They have brought a number of cases of mismanagement to light, including the unauthorised use of defence land for running golf courses. Internal audit procedures are well-structured, under the Chief Controller of Defence Accounts, with Regional Audit Of ces (RAOs) and Local Audit Of ces (LAOs) performing audits at lower levels. But despite the right systems in place, oversight of defence institutions is still weak. Responsible and transparent management of procurement systems is essential for the world’s largest importer of arms by volume. And the Indian government has shown a strong commitment to getting this right. Japan has passed security legislation this year that will include the right to collective self-defence. These changes to the role of the Japanese military have been the subject of much debate. For the critics, it is clear that the Japanese Government will need to do more to convince them that Japanese defence institutions will contribute positively to international peace and security. Demonstrating that the military operates with integrity and high levels of accountability and transparency is critical. In 65% of the countries we studied, public trust in the military’s ability and will to address corruption was found to be low or very low. In many countries across the region, military budgets are growing faster than oversight capability creating a huge risk that public funding can be diverted through poor procurement practices and undermining public con dence. In several countries, there is evidence that political leaders recognise the extent to which this undermines their legitimacy. Poor procurement practices are not just about the waste of public funding. Ultimately the failure to align defence budgets with needs undermines a nation’s security and destroys domestic con dence. Non-strategic procurement has a signi cant impact on militaries’ ability to ght effectively: they may procure equipment that is unsuitable or that they cannot properly man, or acquire multiple platforms that serve the same purpose. In many countries across the region, there was little evidence that the expansion in military power in the region has been carried out in support of strategies, while acquisition planning— the process through which the state identi es what arms it will buy—is weak in many of the states studied. In some cases, there is evidence that the armed forces may be acting in direct contraction to the needs of their people. The failure of the military to act in the interests of citizens leads to the loss of government legitimacy and can spark civil unrest and violence. While there are numerous enablers of con ict in Asia, evidence shows that corruption inside armed forces is contributing to regional instability in some cases. 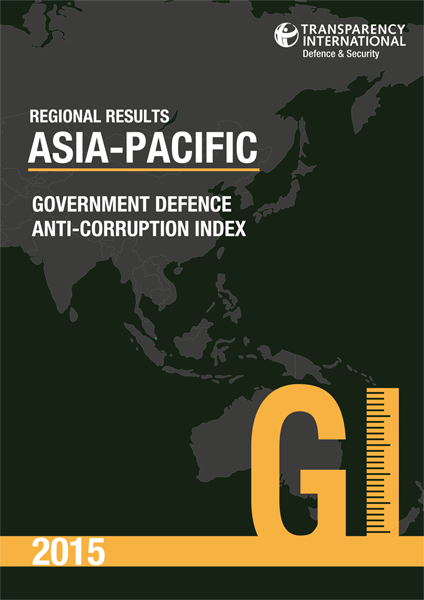 Several countries in Asia Paci c have been conducting major anti-corruption campaigns. Long-term success depends on building a rm legal basis for the oversight of defence, as well as strong independent institutions focused on building integrity and reducing corruption. Prosecutions are an important deterrent but impact is severely limited if autonomous oversight mechanisms capable of identifying corrupt activity are not in place. China’s major anti-corruption crackdown appears largely punitive; the Central Commission for Discipline Inspection stated that more than 180, 000 cases were being investigated, involving Party, government, and PLA of cials, though exact numbers of military of cers charged with corruption offenses are unclear. Our research identi ed strong top-down government anti-corruption messages but only limited evidence of efforts at wider institutional changes or fundamental improvements in transparency that would increase public con dence. A strong legislative base and robust rules and procedures are an important foundation for strong institutions. In many cases across the region these exist in theory but weak oversight and a lack of transparency create huge risks for the large-scale theft of public funds. Independent oversight mechanisms, including strong audit functions which are capable of identifying abuses of authority or ideally preventing them, are vital for strengthening institutions and building public trust in the long-term. Here, there is a very mixed picture across the region. Only 29% of countries were found to have independent, effective organisations tasked with countering corruption. Twelve of the 17 countries assessed were not found to have internal audit systems adequately transparent and subject to parliamentary oversight.